Nurelion is an aging Altmer mage who runs The White Phial in Windhelm, an alchemy shop named after a legendary artifact he's spent most of his life trying to find. Now that he's finally learned of its location, a recent illness is preventing him from getting it, granting you the opportunity to retrieve the White Phial for him. Known for his short temper and disrespectful remarks, his assistant Quintus Navale has to put up with Nurelion's behavior every day, but considers it an honor to work for the brilliant alchemist. Ask Quintus why he works for Nurelion, and he'll be shocked by such a question: "Are you kidding? I came all the way from Cyrodiil just to work with him. He's... he's not the best teacher. But just watching him, I've learned so much." Similarly, as he greets you, he often praises his master: "My master can be a bit short-tempered, but I've learned so much from him." and "I'll never have Master Nurelion's skill with potions." Nurelion wears a set of merchant clothes along with a pair of boots. He wields an iron dagger and carries the key to the store along with a selection of common items and gold. His schedule is bugged, so he only offers his services from 8am to 8pm and eats for the rest of the time. He usually greets you with: "Alchemy is simple. Unless, of course, you are simple. Then I can't help you." or with an angry: "Must you bother me now? I've almost figured out where it is." Hang out in his shop, and you can often hear him shouting inhospitable remarks: "I don't appreciate loiterers, if that's what you're here to do." and "I hope you have coin to spend, and you're not just here to gawk at my goods." He will, however, show more respect when you leave the conversation during his services: "I hope to see you again soon. "; or outside his services: "If you have need of tonics or potions, come see me at my shop." When you talk to him about making an investment in his business, he'll tell you, "Ah yes, good idea. Best to let a professional businessman handle that money for you." After giving him the gold, he will remark, "A wise choice, my friend. After all, what would a common adventurer know about the complexities of finance?" Approach Nurelion, and he'll greet you with: "I'm so close to the answer..." You can ask him what they were arguing about, and he'll explain: "Just a man's life work, is all. I've finally derived the location of the White Phial, but this doting busybody won't let me get it." Unless you leave the conversation then, you'll tell him you can get it for him: "You would do that? It's good to know there are some people out there who are willing to help an old man. It's buried with its maker, Curalmil, in a long forsaken cave to the west of here. Curalmil was a crafty one, even in death. You would need the skills of a master alchemist to reach his resting place. Luckily for you, I've already made the mixture. Here, take it. Please... don't dally. I've wasted enough time arguing with my useless assistant here." This marks the start of the quest The White Phial. He has a vast knowledge on the topic, and at this point you can ask a bit of information on it. You can ask him what the White Phial is: "A legendary bottle, forged in the days when Skyrim was just starting its turn to ice. A small container, made of the magically infused snow that first fell on the Throat of the World. It is said that the Phial will replenish whatever fluid is placed inside of it. For an alchemist like myself, it is the most pure expression of my art. To create from nothingness is... poetry." If that doesn't answer your question, you can ask him why it's so important to him: "I have spent my entire life searching for it. It brought me all the way to these frozen reaches from the warm embrace of Summerset Isle. Entire years spent in libraries. Seeking out tiny villages with local legends that contain but a whisper of a hint of the Phial. I even named my shop after it, hoping that it might attract anyone who had heard of it. And now it's within my grasp... but the Eight, it seems, have chosen me for their amusement. ... for in my current condition, I'll never be able to lay my hands on it." Be warned he will often insult you when you leave the conversation at this point, for he deems you are wasting time instead of getting the phial for him: "Why are you still standing around here? Go get me the Phial, you fool." Consequently greet him, and he'll wish you luck: "May the Eight guide you to the Phial..." On asking Quintus if he thinks the phial exists, he'll add: "It doesn't matter what I believe. Nurelion does, and it might be the only thing keeping him alive right now." 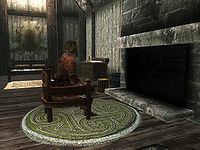 Nurelion stares at an empty fireplace. Return with a broken phial, and face a disappointed dying old man, sitting in his chair in front of the fireplace upstairs, when you tell him you've brought it: "This... it matches every description of the Phial that I've found in lore. But if it can't hold liquid, there's no way of knowing. How did you manage to damage it, then? This is what I get for not retrieving it myself." When you tell him it was like this when you found it, he'll throw you some more rude remarks out of disappointment and fatigue: "Figures -- I doubt you have sufficient knowledge to harm the Phial even if you wanted to. Either way, this is the end of it. Now if you'll excuse me, I'm not quite in the mood to entertain guests. I trust you can show yourself out. Here's for your trouble. ", after which he gives you a mere five gold pieces. If you leave the conversation before telling him you've found the phial in that condition, he'll utter: "Of course, leave an old man with a ruined dream. Just like everyone else. Fool." Either way, he'll stand up to get in bed, waiting for his death. Quintus will approach you to thank you for helping his grumpy master: "I want to thank you for your help. I know my master can be a bit short at times." He'll make up for his master's tiny reward, and end the conversation with: "Now, if you'll pardon me, I'm going to tend to Nurelion. I can make his final days a bit less painful." "Master, look. It's the Phial." Quintus: "Master, look. It's the Phial." Quintus: "It doesn't matter. Look, it's refilling with your tonic as we speak." With this last expression of passion, Nurelion exhales his last breath, having been able to witness his life-long dream come to fruition. When you approach Quintus, he explains as you ask him what happened to Nurelion: "He is gone. But thanks to you, he died knowing his life's work was not in vain." When you tell him you're sorry to hear, he'll agree: "As am I. You acted very nobly in helping my master realize his life's work. Thank you for that. As for myself, I've always been content to simply be an alchemist. I fear keeping the Phial would just remind me of Nurelion's obsession, and how it consumed him. Here, keep it. You are as much a part of its legend now as Curalmil was. I hope it brings you the happiness that my master desired." 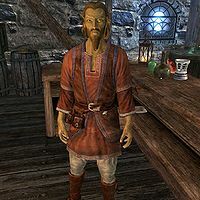 Quintus will take over the shop, and Windhelm guards may now be heard greeting you with: "With Nurelion gone, I suppose Quintus has taken over business in the White Phial." Asking Quintus what he'll do now that his master has passed, he'll claim: "I'll carry on his tradition as best I can. I could spend a lifetime just going over his notes." Nurelion: "Quintus, could you fetch me a copy of The Firmament? I need to compare the old star charts to today's." Quintus: "Did they really record the star positions from Curalmil's tomb? There's no way it's that precise." Nurelion: "Confound it, boy, I know what I'm doing. It will help me determine the season of his burial, which I can cross-reference." Quintus: "I... I apologize, master." Nurelion: "Don't waste time apologizing, just find the book!" Quintus: "Master, I have a question about infusions of arrowroot." Nurelion: "Damn it, child, didn't I tell you to gather my notes on sub-material properties?" Quintus: "Yes, and I'm working on it, but I'm also trying to..."
Nurelion: "When I ask you for something, I expect it to get done." Quintus: "Yes, master, I know. I just want to keep up my own projects as well." Nurelion: "You can waste your own time, not mine. An apprentice obeys his master. A good one does, at least." Quintus: "Yes, master. I'm sorry, I'll get back to those notes straight away." Nurelion: "I'm sorry to always be so hard on you, boy. I just worry I don't have much time left." Quintus: "I know, master. Don't say such things -- there is always time." Nurelion: "Don't be so sure. Now, have you finished grinding the dried snowberries?" Quintus: "Erm... no. Not yet. I'm sorry, I was reading up on the effects of distillation." Nurelion: "What? You've been lollygagging in idle reading?" Quintus: "No... I was trying to..."
Nurelion: "Out of my sight!" Nurelion knows no spells despite being a mage. If you walk away from the conversation when you've given the broken phial, you can still tell Quintus that Nurelion only gave you five gold coins despite not having gotten anything. After Nurelion gets in bed to await his death dialogue cannot be accessed. If dialogue is attempted in his deathbed a box will show explaining he is laying in bed and dying. Nurelion's schedule was supposed to be more diverse. He was supposed to have breakfast from 6am to 8am, have dinner from 8pm to 10pm, and sleep from 10pm to 6am. These packages have no duration however, so his breakfast package overrides the others due to its position in the schedule list. 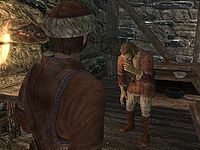 If you get a fishing job from the Thieves Guild intending for you to pickpocket Nurelion and you have completed The White Phial quest, the job will become impossible, as only the "asleep and dying" message will appear. Solutions to this are either to quit the job or complete it using the console. This issue has been addressed by version 1.3.3 of the Unofficial Skyrim Patch; now Nurelion is prevented from getting selected as a target after completion of the White Phial. Nurelion may be heard shouting out his idle remarks from his bed after completing The White Phial, although apparently he's supposed to utter them only during his services. After he is alseep and dying, he will sometimes get out of bed if Quintus sees you steal or forge numbers. If you attack Quintus at this point, Nurelion will turn hostile but he will be intangible and attacks pass through him. ? With Dawnguard installed, you can feed on him multiple times as a werewolf after his death, though he will only increase perk progress once.